I have an interior Jack and Jill bathroom that is connected to two bedrooms. I'm trying to solve the problem of someone locking the other door when using the bathroom and then forgetting to unlock it before leaving. Trying to come up with a solution, I thought of synchronizing the two locks via a light sensor. Light on, both doors lock. Light off, both doors unlock. Unfortunately, I'm unable to find a lock to achieve this. Does a lock like this exist? What would be another viable solution to this problem? DO NOT BUILD THIS PROJECT. It is not safe. I am leaving the description here for now to retain the comments. For a safe version of the Jack&Jill bathroom project see my other answer, that begins with "I think I understand all the requirements:"
Shop for "Electric Bolt Locks (Fail Safe)". These sell for about $40 to $500 but you certainly don't need the expensive kind. They operate on 12VDC or 24VCD so you can wire them safely and easily. Install one on each door and control them both from a single switch inside the bathroom, so that both are locked or unlocked together. To deal with the possibility of the locks somehow "failing secure" instead of "failing safe" you should get locks that also open with a key (or a pin -- thanks @Tim B), and you should place the transformer somewhere outside the bathroom. You could use a switch near each door, either in a 3-way or a parallel circuit. The parallel seems less confusing because you can say "Both switches need to be down to get out of the bathroom." Or if you really want to make the locks to operate with the light then you can just wire the transformer in parallel with the light fixture. Of course this will result in people occasionally thinking they are locked in the bathroom when they are not. In any case make sure the locks themselves are wired in parallel. Also, to solve the specified problem, opening the door this way, without any other required motions, must normally (ie. absent failure or emergency) unlock both doors. Requiring additional motions to unlock both doors would obviate the prupose of the project; you might as well put up a sign and be done. Locking both doors must be easy and natural, preferably with a control near the doorknob. I'm not going to try for an automatic solution, such as connecting the locks to the light, because I can't devise a reliable way to tell if the room is occupied. The house occupants must be able to override the locks from outside the bathtoom (eg. to prevent someone from locking herself in). Having a key or pin hanging nearby is probably acceptable in most households. a roll of low voltage wire, amount depending on size of bathroom etc. A storeroom lockset always opens from the inside by turning the handle, and is always locked and operated only with a key from the outside. (Usually the outside handle doesn't even turn.) A door with this fitting can be opened from the inside even in a panic and regardless of the state of the strike plate. The storeroom lockset satisfies requirements 1 and 4. A "fail safe" electric strike plate will hold the door locked from the outside when energized, and release it when the current is off. The plan is to maintain the strike plate current with a latching relay. 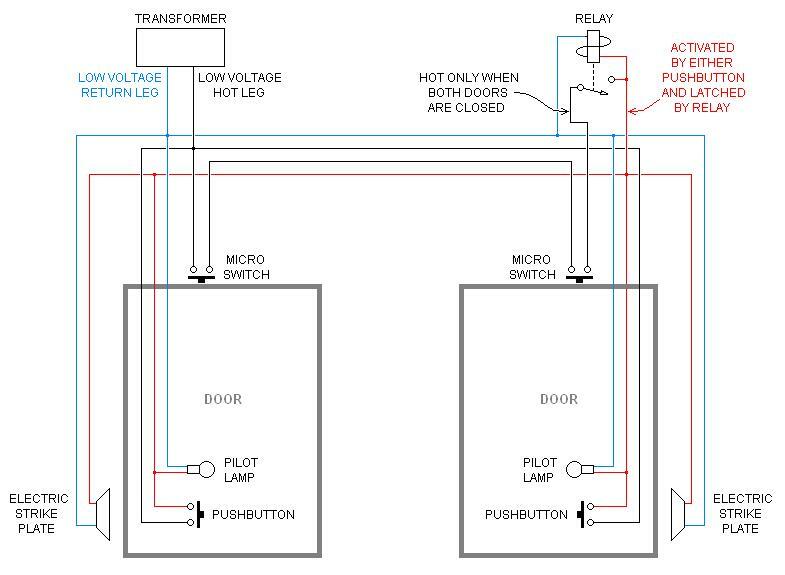 The micro switches or magnetic switches will unlatch the relay when either door is opened. The required latching relay can be made from a single-pole single-throw normally-open relay, since the relay coil power can be made to flow through the micro switches. The electric strike plates, micro switches, and latching relay satisfy requirement 2. The pushbuttons should be mounted inside the bathroom near the doorknobs. I think the best place is on the door, just above the knob, with a tasteful plaque reading "LOCK BOTH DOORS". I have shopped for lock sets and strike plates with built-in switches but have found nothing, hence the pushbuttons. I like to put pilot lights on everything so I would buy pushbuttons with built-in lamps wired independently from the switch contacts. Failing this I would use doorbell buttons and separate pilot lights. The purpose of the pilots is to reassure the bathroom occupant that both doors are locked. The voltage of the illuminators must match the voltage of the strike plates. The pushbuttons satisfy requirement 3. This is the weakest part of the design because you are forced to use something made for a different purpose. Electric strikes (retractable door-jambs), which secure with the bathroom light on. Now leave the privacy locks on both doors locked all the time. If the light is off, the strikes are released and the door can be pulled open, locked or not. Wire outlets off the bathroom light, one near each door handle. Put red night-lights in them. If a user sees the red light on, that means the bathroom light is on, and they should knock. Abolish the privacy locks. This is easier wiring than the strikes. Put a turkey skewer on a light chain next to the door handle, so the locked out person can easily override the privacy lock. Now if Jack is barging in on Jill maliciously, you have a problem - he probably knows about the turkey skewer trick. When Jack gets back from military school, he can find a portable RV toilet in his room, entry-grade locks on both doors, and Jill has the only key. Not the answer you're looking for? Browse other questions tagged bathroom doors light-fixture lock or ask your own question. How to get a new tumbler pattern to re-key existing locks?